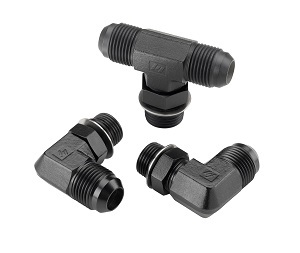 CLEVELAND  Brennan Industries Inc., a leading international supplier of hydraulic fittings and adapters, announces its Brennan Black® coating, the most advanced protection against rust and corrosion. This proprietary Bi-LENE® coating is a blend of fluoropolymer, engineered plastics and selected corrosion inhibitors that is tailored to provide specific properties for particular applications unlike conventional fluoropolymer coatings. The properties consist of low friction, strong adhesion, resistance to wear and abrasion, excellent resistance to corrosion, chipping and elements such as weather, sunlight and salt water. Field and lab tests show the coating resists corrosion past 1,600 hours of exposure making it at least 300 percent more resistant to corrosion than competitors advanced plating. It works in a wide range of temperatures from negative 420 degrees Fahrenheit to 500 degrees Fahrenheit. The Brennan Black coating is best demonstrated on steel hydraulic adapters, where it provides unparalleled performance in resistance to corrosion. The Brennan Black coating is also available throughout five additional Brennan Industries product classes. Test results are available upon request.